Why join a club, and if you’re going to be part of a club, then why choose ONE? Why indeed. Get one member’s experience and perspective below. Like many Triathletes around the world, finding the right fit for equipment for running, cycling and swimming is very difficult. The same can be said for deciding to join a triathlon club. There are many to choose from but finding the fit sometimes takes awhile. And so it was for me. Being an “old school” guy from the 80’s, even the decision to join a club was difficult. Am I fast enough, what will people think of me, am I too old, can I keep up with the group, were just some of the thoughts that I wrestled with. Like most everyone else in the triathlon world, training is a lonely and rewarding part of the sport so athletes tend to get use to being on their own. This has been true for me as well for 30+ years. Then last summer Lifetime Fitness along with ONE Multisport had a joined July 4, ride on the Tour de Scottsdale course. That morning turned out to be a blazer, 100 degree plus early on. Like all group rides this turned into a go fast ride and once we got to the turn on Dynamite the group stretched out pretty quick. Of course trying to catch up on 9-mile hill is no picnic. As we got to the bottom of the hill, there was the ONE Multisport team handing cold drinks and cookies to every one. It made me think, who would come out here on a steamy, hot, July morning over 100 degrees and hand out drinks and cookies to complete strangers. As we left, I thanked everyone, as they were all as gracious as could be. On ride from back to Lifetime Fitness, my decision about joining a club was solidified. 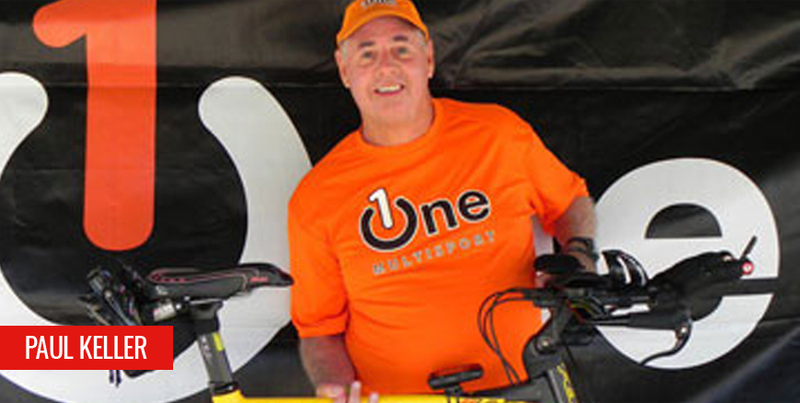 I was positive that ONE Multisport was the club for me. Anyone who would help out complete strangers in those temps had to be the kind of people that I could relate to. I finally emailed John Dean my resume. I have got to tell you it was a little intimidating, as I didn’t know what to do or what to say. I’m sure John had a big laugh as it seemed like I sent him a job resume with references of my triathlon history. John eloquently sent me a note back that eased all my fears. Just show up, Ride Fast and have a blast! My son, Kiel has a plan that we could both do IMAZ 2012, together next year and that too probably led us to joining a club as much as anything. I have learned over time that it takes family, training, rest, nutrition, mental toughness, and positive reinforcement to make it through an Ironman. This is exactly where ONE Multisport becomes a corner stone for a successful triathlete. Being able to draw from so many talented athletes is really helpful. For the beginner as well as an old school guy, ONE offers all facets of triathlon knowledge but most of all a bond that the team is there for the triathlete and their families. Since I have joined ONE Multisport, I have met many wonderful people. All have offered encouragement and support. For that I’m most grateful. In closing, I would share a story. In 1987 Iron Canada, I had just crossed the 13-mile mark in the run at about 11 hours, when I came across a lady that had hit the wall. It was dark by then and the course was not lined with people. She told me she couldn’t go another step. We talked for several minutes as she considered her options. I told her that I would walk with her to the finish if she didn’t quit. It took 4 hours to walk the last 13 miles and along the way we picked up two more fellas that had the same thoughts about quitting. We all finished! When I got back home (Fairbanks, Alaska), many of my friends asked me why did I stop and help some one I never met, knowing that I would not have done my best time. That was easy. I knew that it was the right thing to do. It’s the true spirit of triathlon. Helping ONE another!